January 30, 2010 Dan O.
I highly doubt any of these guys would be cops at all. When a local patrolman is implicated in a controversial shooting in a small New Jersey town, put-upon sheriff Freddy Heflin teams up with Lt. Moe Tilden (Robert De Niro) to investigate a connection between the mob and the NYPD officers who live in the town. Sylvester Stallone delivers a dramatic performance in this arresting crime thriller as Freddy. Harvey Keitel and Ray Liotta also star. Cop Land is a cop drama that is filled with a lot of those cliches that always rid every single cop film like this. The us vs them mentality, dirty cops, and most of all down-on-his luck cop. I mean I have seen this story plenty and plenty of times, and I just wish a bit more was added on to this film to make its story seem more and more fresh. But the real reason for seeing this film is its rich plot. The story has plenty of twists and turns that actually keep you interested. The film doesn’t try to act like Goodfellas or The Godfather with its mob tie-ins, it more of acts like itself with some really nice set-up suspenseful scenes. I liked how the film didn’t just try to show one story and just leave it at that. No, it had all these three exciting stories all having to do something with crime and justice, and putting them all together at the end. It actually felt like three NYPD Blues episodes put into one long film but it didn’t feel like a TV show and actually had a lot of depth added to it. Sylvester Stallone totally gets rid of his macho action star look that he has done for so long in this rare but effective dramatic role. He gives this down-and-out cop we have seen time and time again, but adds an extra dimension to this character as we understand who he used to be and who he is now. The only problem I had with this huge ensemble cast is that not all of them were quite used as well as Stallone. I mean each does get a considerable amount of screen-time, but they aren’t as focused on as Stallone and I would have liked to see more of these characters lives instead of just one part of them. The problem with this film by the end actually kind of killed the momentum it had going for it. I think the ending as predictable as it was, should have been made in a different far more realistic way. I mean its very very sappy, and doesn’t quite feel right in the film. 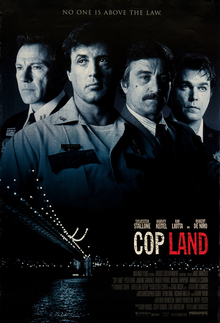 Consensus: Cop Land has its obvious cliches and bad ending, but features a fun and interesting story, backed by an effective dramatic performance from Stallone, but not enough time was given to the others in my opinion. best movie i saw from stallone, deniro, keitel and liotta filmed in jersey. i like seeing robert patrick as a bad guy against stallone. patrick was also good against schwarzenegger in T2 and willis in die hard 2.